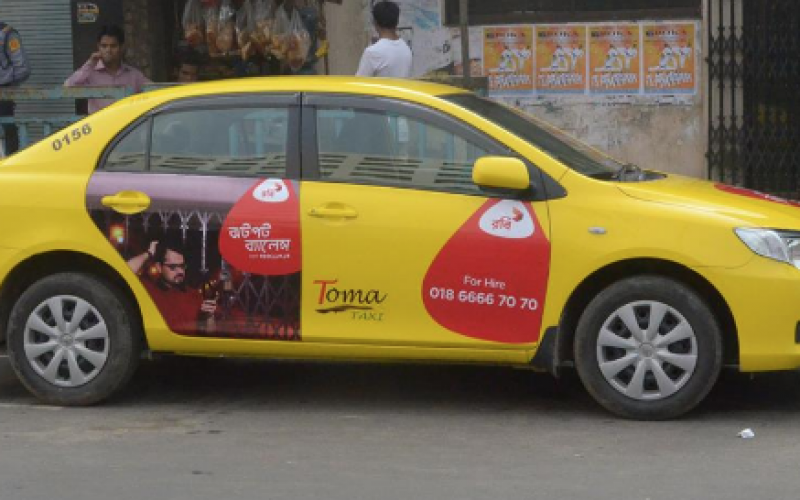 Toma Taxi is a public transport organization to provide safe and comfortable taxi service in broader Dhaka. 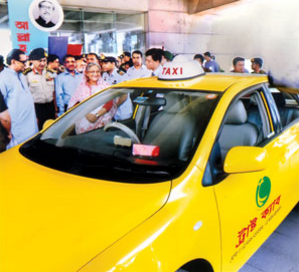 At present Toma Taxi has a fleet of 250 taxi. 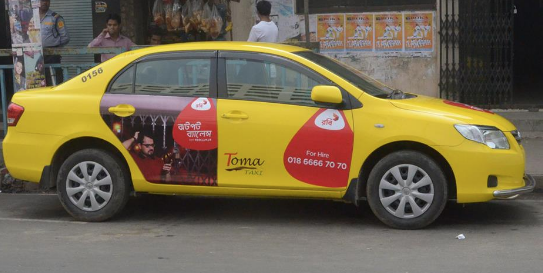 Toma Taxi cab service is good, affordable, safety and reliable. Tk 85 for 1st 2 km. Tk 34 per subsequent km. Tk 8.50 for each 2 minutes waiting time. Tk 20 extra when booked by phone call. Trust Transport Services (TTS) is a project of the Army Welfare Trust aimed at creating job opportunities for retired armed forces personnel and civilians alike by offering quality transportation service to the public. 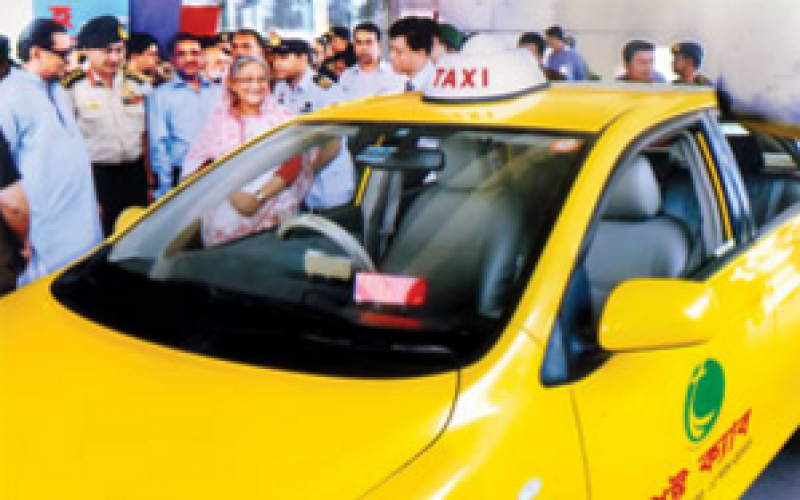 The charges are the same for Trust Cab, as it is mentioned for Toma Cab. 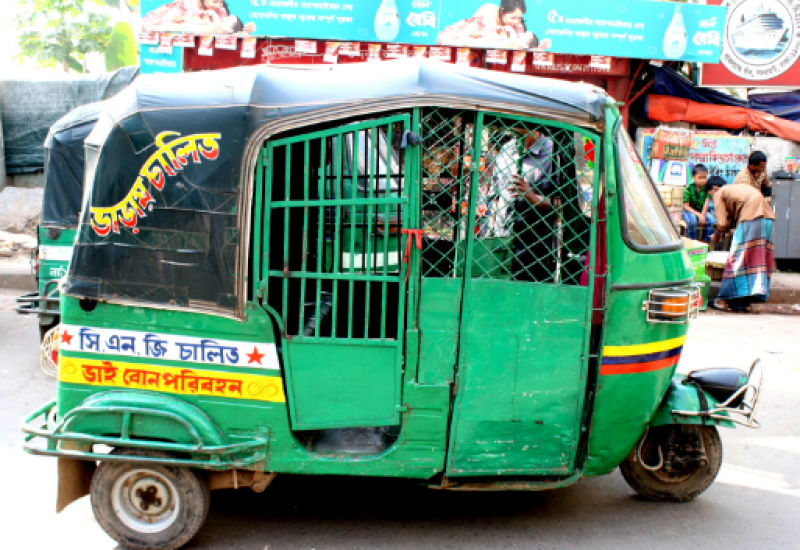 In Bangladesh, three-wheeled auto-rickshaws are called CNGs because these days, most of them run on Compressed Natural Gas. 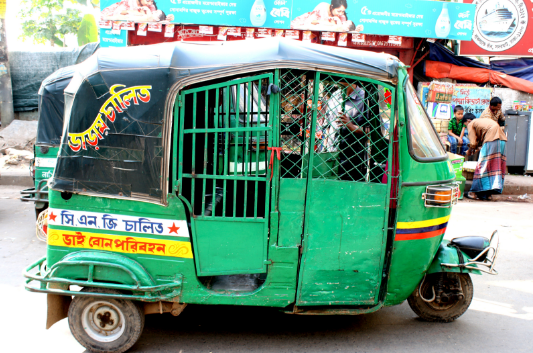 CNGs are ubiquitous across Bangladesh – most people use them instead of regular taxis. 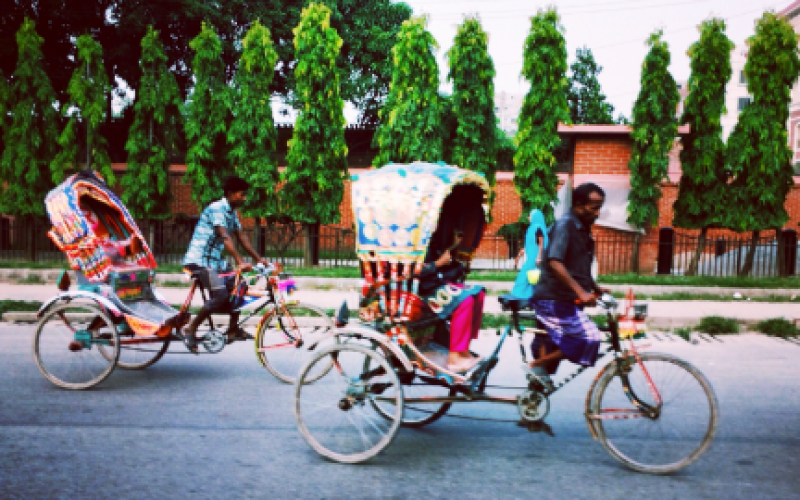 Faster and more comfortable than rickshaws, CNGs cost about twice as much. Thanks to the wire-mesh doors that secure the passenger seat on both sides of the vehicle, they are also somewhat safer to travel in, especially at night. 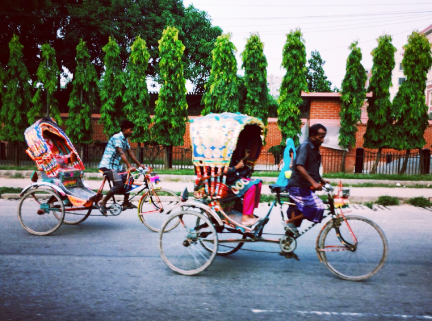 In Bangladesh, all rickshaws are pedal-driven. Fares vary a lot, and you must bargain if you care about paying twice as much as locals, although even that still won’t be very expensive. As a very rough guide, BDT 10 per kilometer is about right. Being the capital and geographical centre of Bangladesh, Dhaka is the natural hub for the country’s bus companies. There are several bus stations around Dhaka, each of them serving a different region of the country. The stations are not for the faint of heart, being extremely crowded and noisy. Sayedabad bus station is for buses to and from the eastern half of the country, including Sylhet Division and Chittagong Division. Sayedabad is currently very chaotic due to the building of a flyover. Roads have been dug up, and traffic is very slow. CNGs in the area all overcharge due to the lack of any order. Gabtali bus station is for buses to and from the western half of the country, including Jessore,Rajshahi Division and Khulna Division. Mohakhali bus station is for buses to and from areas north of Dhaka, including Tangail and Mymensingh. There are occasionally services to and from cities in the north-western portion of the country, such as Bagura. Luxury buses serve locations dotted all over the country. These private buses are air-conditioned, spacey and usually have reclinable seats. Popular operators include Green Line, Shyamoli, Silk Line and Shohagh. Air travel in Bangladesh is very affordable and convenient. Flight time is nearly always less than 1 hour, but can save many hours of tedious and dangerous road travel. There are airports in all of the division capitals and in Jessore, Cox’s Bazar and some other small cities. The leading domestic airlines operator is United Airways (BD) Ltd. with most number of flights, competing with smaller operators like Regent Airways, Novoair as well as with national Airline Biman Bangladesh Airlines. Most of the airlines offer online booking and e-tickets, two-way fares varying from BDT 7,000 to 8,000. There are over 230 mighty and small rivers throughout the country and boats and ferries are an integral part of travel for locals and tourists alike. A journey along the river in any mode is probably the best way to see Bangladesh. Along with BIWTC (Bangladesh Inland Water Transport Corporation), there are a number of private tour operators offering river sightseeing trips of various lengths, or using the ferries to get between cities is a great way to see the country at a moderate pace. The Rocket Steamer service connects Dhaka and Khulna via Barisal, and is a fantastic way to enjoy riverine Bangladesh, for those who prefer the scenic route. The 4 ferries are operated by BIWTC and run six days a week in each direction. It’s advisable to book several days in advance if possible. While there are several different classes it’s unlikely that you will end up in anything but 1st or 2nd class. Both of these consist of around 10 small berths on the upper deck of the boat with 2 beds each and a sink (no doubt doubling as a urinal), and fairly clean shared bathrooms. The fare is BDT 2100 for Delux class. 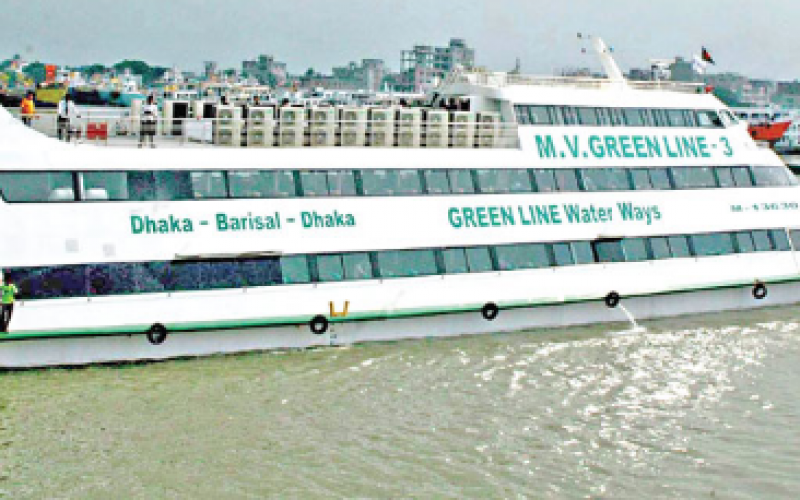 Greenline Catamaran Services, which two luxury ships on the Dhaka-Barisal river route to carry passengers – MV Green Line-2 and MV Green Line-3. The two ships carry passengers up and down the river route two times a day since September 2015. Tickets are available online. The capacity of each ship is 600 passengers. The fare for business class is Tk 1,000, while economy class passengers will pay Tk 700.